The Clearly Dope recently spotted an instant mashed potato machine at 7-Eleven. 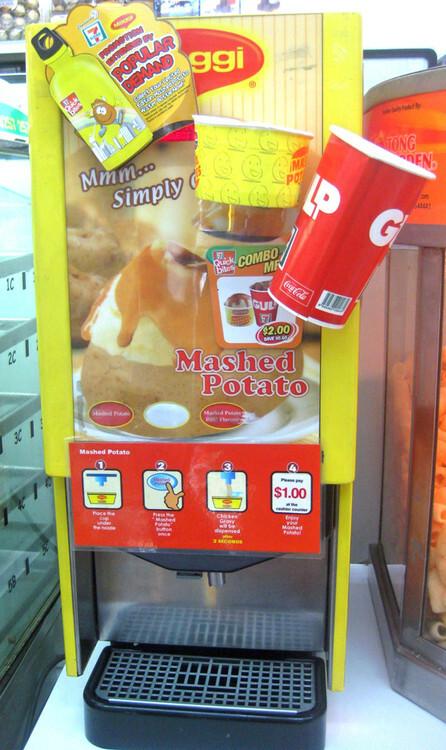 For $1, customers can press a button to make instant mashed potatoes spurt out of the machine, followed by chicken gravy. In this video by Chaz’ Multi-Media Extravaganza from 2009, you can see the mashed potatoes & gravy being dispensed from the machine. The machine is made by MAGGI, a Nestlé “snack solution” product. via The Clearly Dope and That’s Nerdalicious!